Looking to switch up the aesthetic of your home or work environment? Whether you’re on a budget or are rolling in a’ plenty, vinyl laminate may be your solution for hard flooring. It’s a relatively new addition to your flooring options. Some consider it the “super material”. In our continuous quest to ensure that you’re up to speed on the Knox family of flooring options, here are our thoughts on the pro’s of laminate flooring. Vinyl laminate is becoming an important trend in the flooring industry. This is partly because it’s so versatile. It works for offices, it works for kitchens, it works for living rooms and everything in between. It was first introduced due to both its versatility and its scratch resistance. Here at Knox Carpets, we have a beautiful range of Heartridge by Dunlop. This line is becoming increasingly more popular. One plus? You can match vinyl in any areas of your home that will see moisture or water, with laminate in the exact same look and feel for rooms adjacent. You won’t be able to tell the difference at all. This ties into the versatility of laminate. Choose any finish of hardwood flooring and I’m sure that we can match it. Even if you’re looking for a natural stone finish or a ceramic finish, laminate can simulate absolutely any look. Laminate flooring installation goes anywhere. 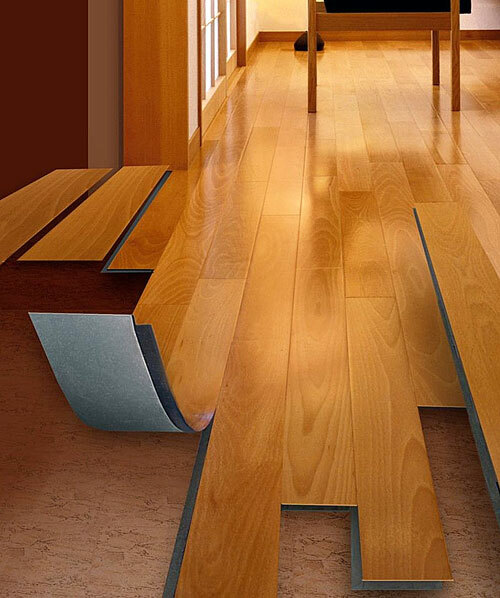 It can be installed over any existing flooring besides carpet. Just make sure that a moisture barrier is set in place and that water prevention measures have been taken. Once these are checked off of your list, it can be installed at any grade. Now you won’t have to worry about the hassle and expense related to removing your old flooring before getting the installation process started. An additional pro that many don’t think about is the packaging. If you’re going for natural hardwood flooring, it will come in planks that are 8 or 10 feet in length. Sometimes the planks are even longer. At the other end of the spectrum, laminate planks simulating the look and feel of hardwood are sold and distributed in 4 foot strips. You can also purchase laminate flooring in tile form. This comes in a variety of sizes. You won’t have to worry about dirt and grime from outside either, so you can feel free to be as adventurous as you please. Laminate flooring is your best option for flooring that will resist all outdoor agents. Water and mud can discolor other flooring materials, but not laminate flooring. It’s even protected from stains and smudges, which is why it’s increasingly popular in entries and hallways. As if that wasn’t good enough, it even fights fading from UV exposure. If your family is prone to colds or allergies, laminate flooring will help. It naturally resists bacteria and growth of mold. It can even be treated with allergen resistant and anti-bacterial coatings, so your family can breathe easy. Tight on time for a remodel? Hardwood needs to sit in its new home for 3-6 weeks before its properly acclimated to the new environment. Laminate is set and ready to go in 36 hours. If we haven’t sold you on laminate flooring for your next home, reach out with any questions and for more information.